Mix with CG celebrities at our networking event. Want to meet Hollywood bigwigs and veterans from the CG industry? 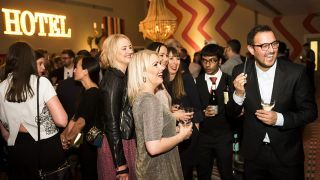 Come to Vertex's London-based networking event and you'll be able to mingle with some of the world’s leading artists, creatives and developers. You can exchange contacts with professionals, and who knows – you might even be able to land your next dream job! The networking event will take place after our panel discussion and it is a fantastic opportunity to speak one-on-one with experts and cultivate new relationships after spending the day attending the recruitment fair, listening to engaging talks and learning new skills in our workshops. Some of the amazing speakers we have attending Vertex include the likes of CG Labs director Chris Nichols, Digital Domain co-founder and industry veteran Scott Ross, Allegorithmic CEO and founder Dr Sébastien Deguy, VR genius Glen Southern, Danny Sweeney from Creative Assembly, freelance 3D artist Maya Jermy, Bader Badruddin from Blue Zoo and much more. Scott will be speaking to 3D World editor Rob Redman about the future of British VFX after Brexit, looking at the pitfalls and opportunities. Don't forget we also have an incredible workshop from The Mill's Adam Dewhirst, who will walk you through how to create a digidouble in a day, using a range of techniques from photogrammetry and mesh wrapping to The Mill’s custom human rig. Dewhirst will delve into The Mill’s ‘master human set up’, and highlight how they’re investigating the future challenges of CG human models. Meanwhile, Saddington Baynes' Chris Christodoulou and Marc Shephard will demonstrate the technical backbone and processes that sit behind mass customisation in a special duo workshop, alongside the tools and software that can help artists work faster (with emphasis on Maya and Nuke). The mixer is only available for Access All Areas ticket holders so get your tickets now! Vertex is the event for the CG community. Book your ticket now at vertexconf.com, where you can find out more about the other amazing speakers, workshops, recruitment fair, networking event, expo and more.